The idea for this savory tomato granita evolved from a sort of cold tomato soup that is served only occasionally during the summer at l'Oustau de Baumanière in Les Baux, Provence - an unforgettable combination of the ripest tomatoes and the essence of basil and olive oil. They call it their version of gazpacho, but it's so much better than any other gazpacho I've had. I started by trying to emulate that soup, but I wanted something even colder and more refreshing, with an even more intense tomato flavor. So I oven dried most of the tomatoes, and instead of just cooling the tomato pulp I froze it into a granita. I love the way the red crystals sparkle inside a glass tumbler, which is the way I like to serve it. With a sprinkling of basil leaves and coarse sea salt, and a drizzle of extra-virgin, extra-fruity olive oil, it makes a terrific first course, amuse-bouche, or between-course refresher for a summer meal. One of my favorite summer lunches this year is a little scoop of this in a cup, and a tuna sandwich made with aioli (garlic mayo) on whole wheat toast. Since it is frozen you can make as much of it as you want at one time, if you happen to have a bumper crop of tomatoes. 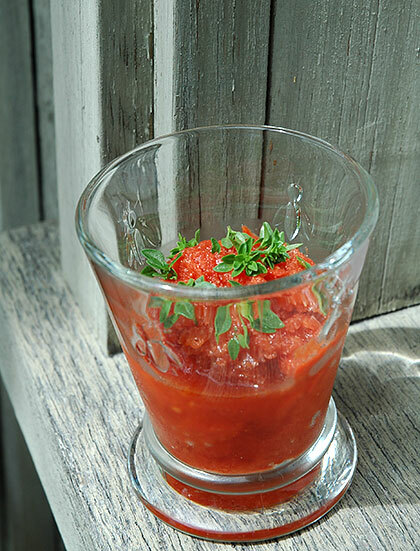 You can only really make this granita in summer, since it requires the ripest, juiciest tomatoes you can find. I used a deeply lobed variety called Marmande that's easily available here. Any heirloom variety would work well, such as Brandywine (the best heirloom tomato in my opinion) or a locally grown beefsteak type of tomato. The important thing is that it has to be vine-ripened. Oven-drying them for a relatively short time seems to intensify the tomato flavor without actually cooking them (regular oven-dried tomatoes stay in there for about 6 to 8 hours). For the garnish I've used tiny mini-basil leaves from the lone plant that's still surviving in our garden. You can use regular basil too, finely shredded. And yes, you do need the fruitiest extra-virginist olive oil you can find and afford. To keep the calorie count low, you can omit the olive oil and not miss it too much. Preheat the oven to 100°C/about 200°F. Cut the tomatoes in half, and scoop out the seeds. Put 10 of them skin side down on a baking sheet lined with parchment or non-stick silicon paper. Sprinkle with just a little sea salt, and drizzle with a little olive oil. Put in the oven and leave there for 90 minutes. Take out the oven-dried tomatoes, let cool and scoop as much pulp as you can out of the skins. Press the rest through a sieve or a chinois, to get as much tomato juice out of them as possible. Peel the remaining 2 unbaked tomatoes by dunking them for 30 seconds in a pot of boiling water, then cooking right away in cold water. Cut in half, scoop ou the seeds, and pass throug the sieve. The unbaked tomatoes will be more pale and watery. Mix well with the pulp of the oven-dried tomatoes and balsamic vinegar. Put the tomato mixture in a shallow plastic container with lid, and place in the freezer. After one hour, take it out and mix the frozen parts with the unfrozen parts. Put back in the freezer. Repeat 2 more times. At this point it's ready to serve, but if you make it in advance, put it in the microwave on the Defrost setting for 3 minutes before proceeding. Mix the granita well with a fork to get rid of any big lumps. Spoon into glass tumblers. Decorate with the basil, optionally sprinkle with a few grains of coarse sea salt, and drizzle a little olive oil over each. Submitted by maki on 2006-08-01 17:32. It may not work that well with fully dries tomatoes Ellen - because you do need that juice. That's why I only dried them enough to concentrate the flavors a little bit. This looks refreshing! Definitely needed on a week like this one on the East Coast, where we're hitting 100+ degrees for a couple days straight! So simply sauteeing in olive oil wouldn't concentrate flavors enough? I have dehydrate function for oven, and will try this recipe tonight.